Poor water drainage around residential foundations causes millions of dollars in damages every year. Water is the major enemy of your foundation. If there is too much water foundation bow, rise, and buckle. Controlling water and waterproofing will prevent this water damage and help maintain the structural stability of homes. Keeping water drained away from foundations is important for many reasons. First, is to protect occupants and keep them dry. Second, soils supporting the foundation need to be kept at a consistent moisture level to prevent settlement, differential movement, and heaving. Next, drainage is required by building codes. Gutters – Roof gutters should be well maintained and downspouts should be directed below the soil surface through rigid piping to either popup emitters, drywells or to daylight. Maintaining proper sizing and proper slope of the discharge is very important. Trees – According to US Housing and Urban Development Department trees should not be planted any closer than their mature height to prevent excessive moisture draw away from the foundation. 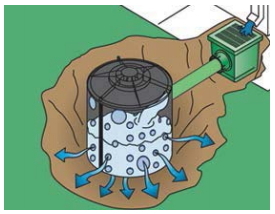 Soil Moisture – Water is gained and lost in a triangular pattern beneath the foundation. Soil moisture is lost first along the edges and then downward and towards the middle of the foundation. Soil moisture is replenished in the same way. Surface Drainage – Controlling surface rainwater is critical to controlling soil moisture and preventing foundation damage. The ground surface should be sloped at least ½” per foot for 10’ to promote water flow away from the foundation. Channel Drains – Channel Drains create a pathway for water coming off of hard surfaces. Often channel drains will be placed between driveways and garages to trap water and direct it toward a catch basin or emitter. Foundation Drainage Boards – Drainage boards or dimple boards are installed on the outside of concrete walls to direct water to the perimeter drain tile. The semi-rigid material is installed over a waterproofing membrane and has “dimples” or ridges that direct water away from the foundation and toward the drain tile. 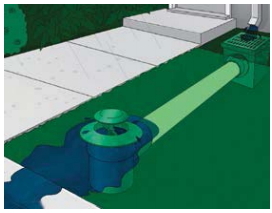 Subsurface Drainage – Perimeter foundation drains should be made from rigid drain tile, which is connected to a sump pump system or run to daylight. Drain Pipe – Drain pipes should be placed alongside the footing. They can be placed in an exterior position, interior placement or both for maximum drainage. Drain pipe should have a slight slope toward the outlet with no low spots. Building Codes – The International Residential Code requires drain pipe around all concrete or masonry foundations that retain earth and enclose habitable or usable spaces below grade. The IRC goes on to mentions approved products such as ASTM approved rigid drain pipe. Whether foundation repairs or waterproofing work is being done, water drainage must be addressed before the job is complete. Water is the enemy of foundations, so keeping water away from the basement or crawlspace is very important to the correct functioning of your foundation. Modern drainage systems like the types ECP supplies incorporate geotextile filters and an aggregate that retain and prevent fine particles of soil from passing into and clogging drain pipes. Non-woven geotextile fabrics are synthetic textile fabrics specially manufactured for civil and environmental projects. In a typical drain application, it would be laid along a trench which would be filled with coarse stone around a drain pipe. The geotextile material is then folded over the top of the stone fill and the trench is backfilled with appropriate soils. Groundwater will seep through the geotextile fabric and then through the stone to the drain pipe. The drain pipe then provides a pathway for the water to travel to a catch basin, drywell or sump pump system.